Every year Carolina Meadows conducts a fundraising drive for our local public television station, UNC-TV. Every year the station announces a theme for its drive and clever folks at Carolina Meadows find a striking way to publicize the theme. This year’s theme was a travel one, highlighting the ways UNC-TV’s programs cover the entire world. Members of the Carolina Meadows fundraising team met and brainstormed ideas to make the theme tangible. Team member Sally Hubby suggested “The Armchair Traveler”, which seemed particularly appropriate for a retirement community where not all the residents are able to travel. The idea was unanimously approved. Sally, whose background is in Graphic Design, volunteered to decorate a chair with appropriate symbols. The design was based on an actual voyage on the Queen Mary. The voyage was charted on a large map which hung in the Carolina Meadows club center lobby. The chair was taken to the Carolina Meadows Maintenance Department whose workers enthusiastically embraced the project of prepping the chair for decorating. However, a disaster almost occurred at the beginning of the prep. Maintenance already had an old broken-down chair on its premises which had been offered to one of the staff. By mistake he loaded the Habitat chair onto his truck instead. He was driving away when he was stopped in the nick of time. A painter in the department provided Sally a paint fan so she could choose a base color for the chair. She chose “Aged White” and the chair was painted with several coats of it. Finally, the “canvas” was ready. However, as you can imagine, having a chair for a canvas presented unique challenges. There is no such thing as a “chair easel.” To paint images on the curved back of the chair, Sally had to tip the chair forward onto her lap, lean over it and paint the symbols she had chosen upside down. Even Michelangelo never faced that kind of problem. and some on the back. They include labels from hotels in Loch Lomond, Granada, Berlin, Naples, Venice, Jerusalem, Saigon, China and Chile and more. When the painting was finished, Maintenance sealed the chair with polyurethane to protect the designs. In addition, the workers built a platform to display the chair. The platform was painted blue to represent the ocean upon which “The Armchair Traveler” could sail. 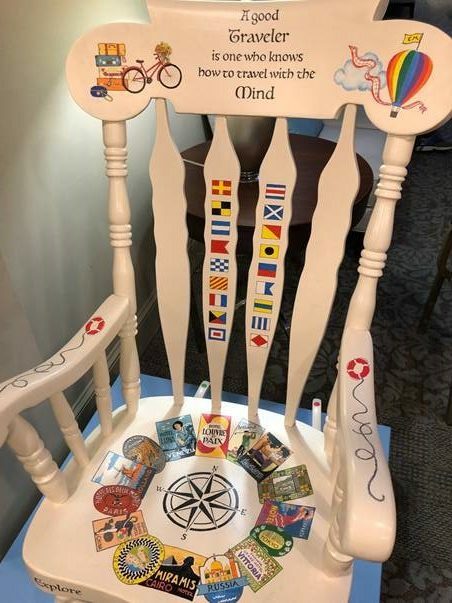 The chair was displayed in the lobby of Carolina Meadows Club Center for several weeks, generating much enthusiasm for the whole fund drive. The chair was auctioned off for $450 and the drive raised well over $54,000. Bravo to the entire fundraising team and Hip-Hip Hooray for Sally Hubby, our wonderful artist!